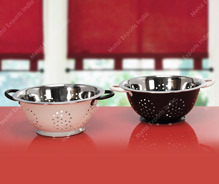 These exquisitely designed and perforated pattern based colanders are made available in sturdy stainless steel finish in comfortable easy to handle designs. Coming in enchanting colors from the outside, these not only offer best utility values in kitchens but can also be used for holding an array of fruits while being placed at the dining tables. - We present below few product samples that we have developed for our clients. - We offer customized products developed as per your requirements and specifications. - Please send us an enquiry detailing your requirements for a quick response. 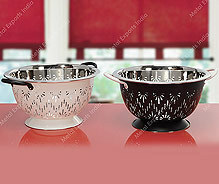 This colorful steel colander is made from enamel on steel with sturdy handles for comfortable grip. Perfect for straining or simply displaying fruit on the table, this fun colored steel colander will draw attention to your kitchen. Infuse a creative spruce to your kitchen with this exquisite sunflower colanders with colored and contrast handles. Great for straining or draining food, can also used to display fruits at the center table. The contrasting handles provide a comfortable grip adding flair to the flawless design. It has deep sides with a large enough capacity to mix up anything from cookie dough to salads. 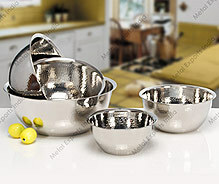 The hand hammered finish steel mixing bowl makes it pretty enough to serve in. An attractive set of bowl with special coating for a lasting finish. The printed top makes it easy to keep your things handy. 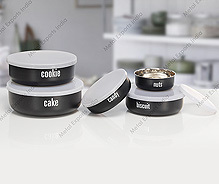 Tight fit lids ensure that the food will remain fresh for an extended period of time. Be sure to use the right size dish and fill the food to the top for minimizing exposure to the air.